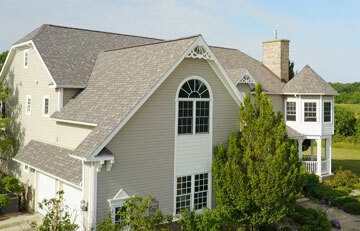 Need a roof estimate for your new installation or only a replacement? We don’t do ladderless roof estimates! If you’re getting a new installation, don’t accept shortcuts on the roof estimate. We get up on your roof and into your attic to find any damage or weak spots. This way there aren’t any surprises on your estimate – we’ll give you the real cost of installing or replacing your roof! We guarantee you’ll only pay the estimated price – not one cent more. Not every roofing contractor operates the way we do. Some want to use drones for your estimate or play a numbers game with online estimators that can be wildly inaccurate. Ballpark online pricing estimators are basically worthless. Even if you’re accurate with the variety of factors for your roofing project, there are too many unknown factors involved. Only a professional can accurately estimate the full cost of installing or replacing a roof by taking into account different pitches, overhangs, porches, etc. Drones are cool – but don’t be fooled! Be leery of companies that do ladderless estimates with a drone. Drones can provide a lot of information but are not a replacement for an estimator. You want someone to carefully look over your roof for any rotted wood or any ventilation and mold issues in your attic. To find those soft spots or problem areas, you need someone actually on your roof and in your attic who knows what to look for. Is it the roofing contractor or a commission sales person doing the estimate! You have to be aware of who is actually coming to your house to do the inspection. Sometimes a roofing contractor will commission out the estimate or someone from their sales staff will do it. “I was told I needed a new roof by a few different companies and when Roofman came out and inspected the roof, he inspected the roof and told me it was good for another 3 years and it did not need replacement. I had one shingle tear back and had it repaired and the other companies told me I needed a new roof and the quotes were over $10,000 for a 10-year warranty. But Roofman was honest and gave me a quote at two thousand less and told me I did not need a new roof. I am so happy that there are still honest people out there. This also gives me a few years to save for a new one. I would definitely hire them knowing that if they are honest enough to tell me the truth about needing a roof then they certainly will hold up their word on the workmanship. Thanks, Roofman!” – Barbara G.